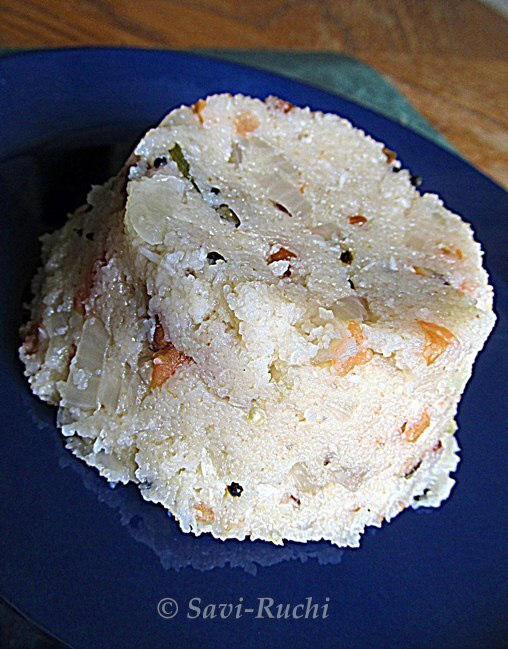 I have already written about my family's love for uppittu/upma. We love it more when it is prepared for dinner, in fact our family prefers eating breakfast items for dinner. Our usual dinner is mostly, akki rotti, ragi rotti, upma, dosa & others. Heat ghee in a broad pan. When ghee is hot, add the mustard & cumin seeds. 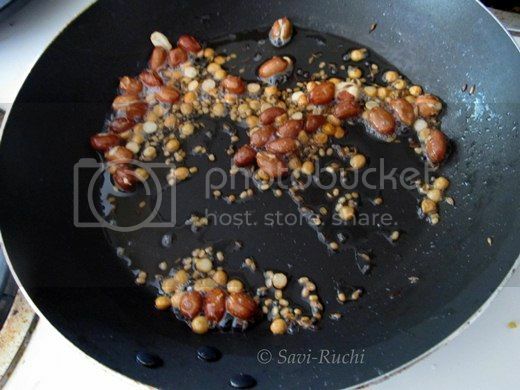 When seeds splutter, add channa dal, urad dal, peanuts & saute till the nuts turn golden brown. Throw in the cashews & roast till golden brown. 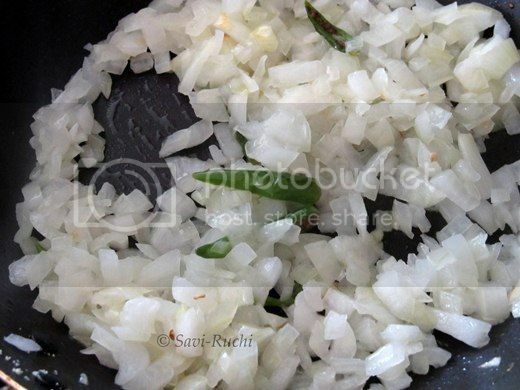 Add the curry leaves & saute till the leaves wilt. 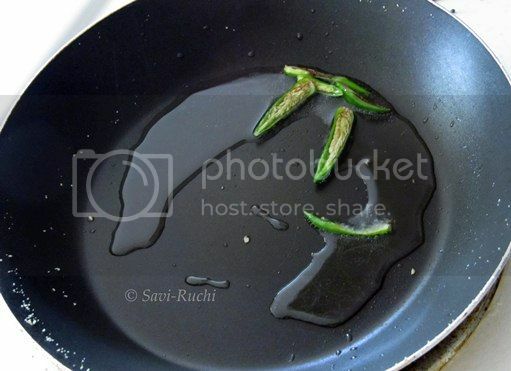 Meantime, add oil in the same pan (The one in which rava is roasted!). 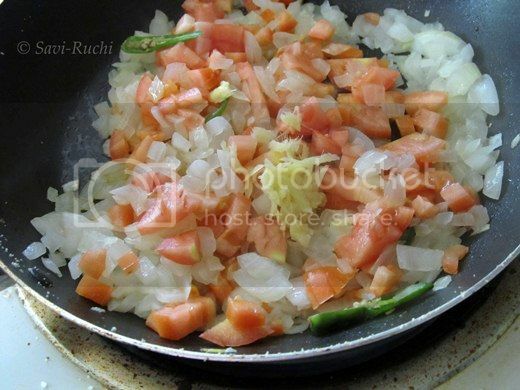 When oil is hot, add the green chillies followed by onions. Cook the onions till translucent. No need to brown them. When onions are done, throw in the ginger & tomatoes. Cook till the tomatoes are soft. Add salt, sugar & the hot water. When water starts bubbling, reduce the heat to medium-low. Slowly pour in the roasted rava & mix well ensuring no lumps. The water will splutter in all directions! Be careful!. 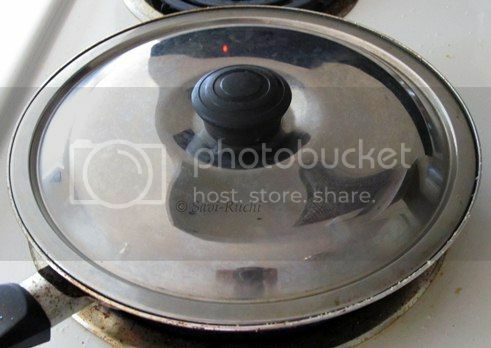 Close it with a lid & cook it covered for couple of minutes or until all the water is absorbed. 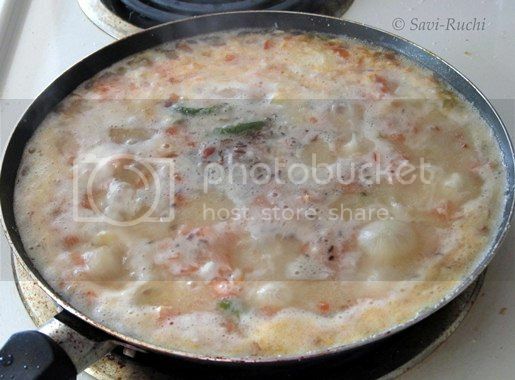 Mix the cooked rava. Turn off the heat. Add lemon juice, coriander leaves, grated coconut & mix again. 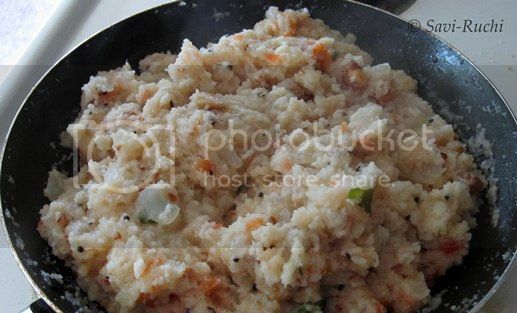 Keep it covered for couple of minutes & serve the steaming hot upma with a teaspoon of ghee. 1:3 is the semolina to water proportion. 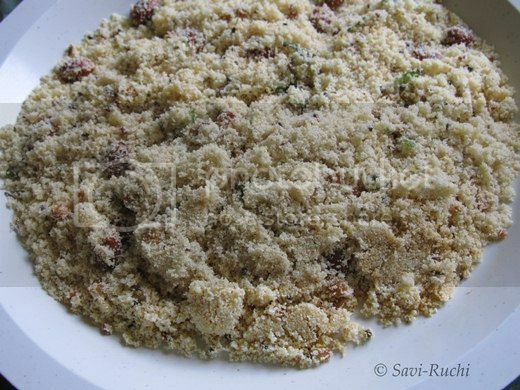 If thicker version of semolina/rava is used, you might have to increase the water by half a cup. 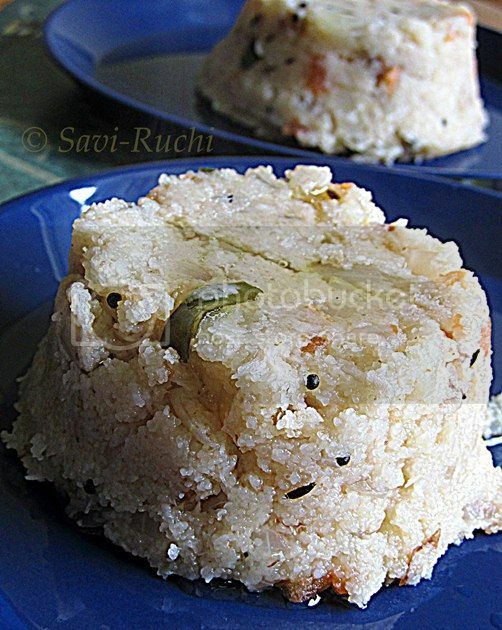 Feel free to add any cooked vegetables of your choice to make this upma more nutritious. More the ghee/clarified butter, better the upma! Ever wondered why rice cooker couldn't give the same consistency of cooked-rice as you get in the pressure cooker? I always did, until I found this trick. Now, some of you may be wondering why soft & sticky rice. 1. 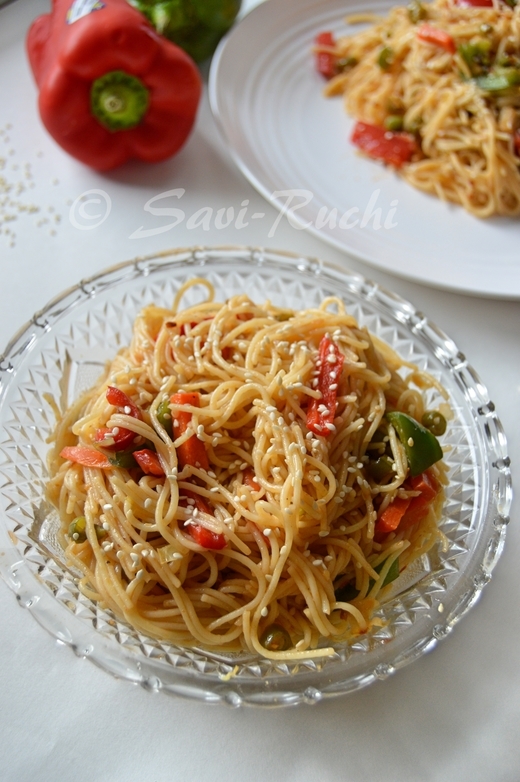 To give it to your kids or elders who prefer soft rice rather than rice with each grain seperate. 2. 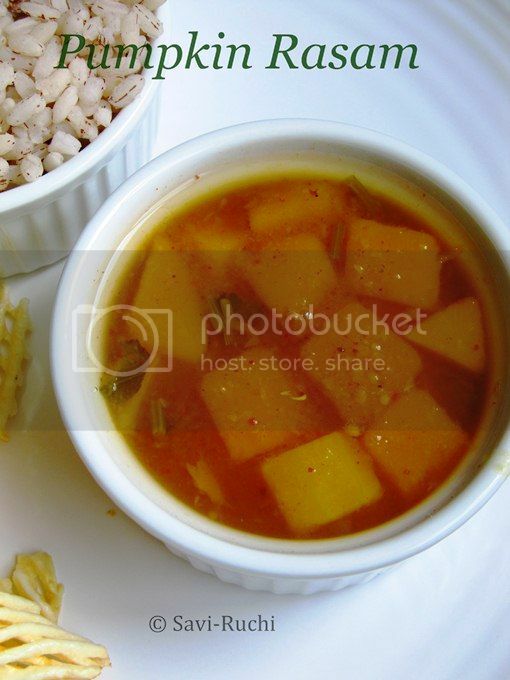 Most families from South India prefer soft rice for their rasam, and sambar. Add 3 to 3.5 cups of water to 1 cup of white medium grain rice. When the water starts boiling in the rice cooker, remove the lid & partially cover the lid. Partially covering the lid ensures no water leakage from the rice cooker. Close the lid once water is almost absorbed by the rice. Follow the same method while making khichdi or pongal in a rice cooker. Add 4 cups of water to 1 cup of rice. Remaining steps as above. I'm happy that in a short time I have made like minded friends here. We go for short walks, shop together & also chat over phone. Not only that, we have started sharing recipes too. One such recipe, I learnt from a friend is this daliya khichdi. Our family liked it so much that, in a week I made it twice. The second time, I did not forget to take the pictures to share it with you all. 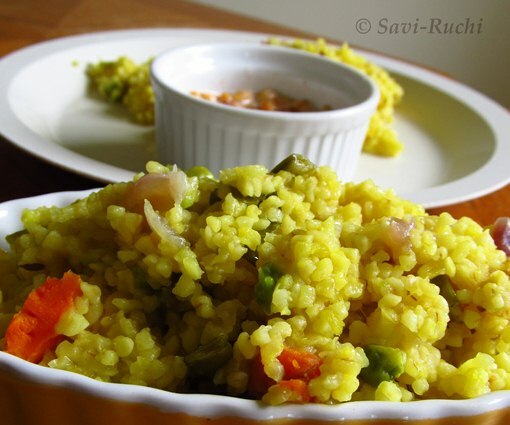 A comforting khichdi that is fast to cook, non-spicy, and also rich in fiber, & protein. Wash the broken wheat & moong dal together. Drain the water & keep it aside. 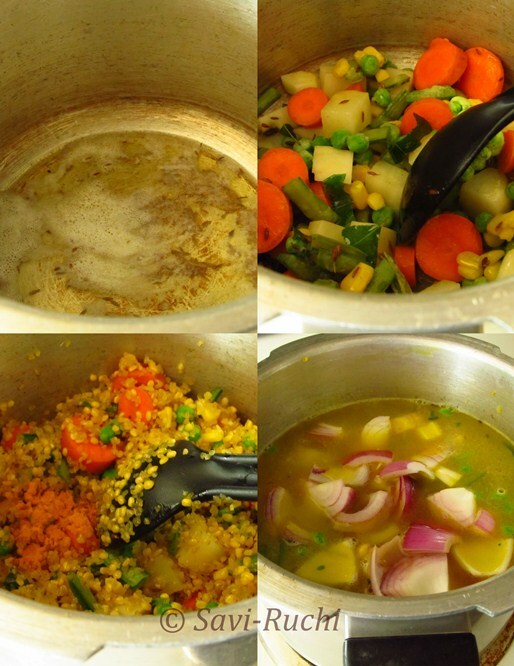 Heat the ghee & oil in a pressure cooker. When the ghee is hot, add cumin seeds. When seeds turn golden brown, add curry leaves. When leaves wilt, add asafoetida. Follow it by mixed vegetables (except onion). Saute the vegetables in ghee for a minute. Add the turmeric, broken wheat & dal mixture to the cooker & saute for 2-3 mins on medium heat. 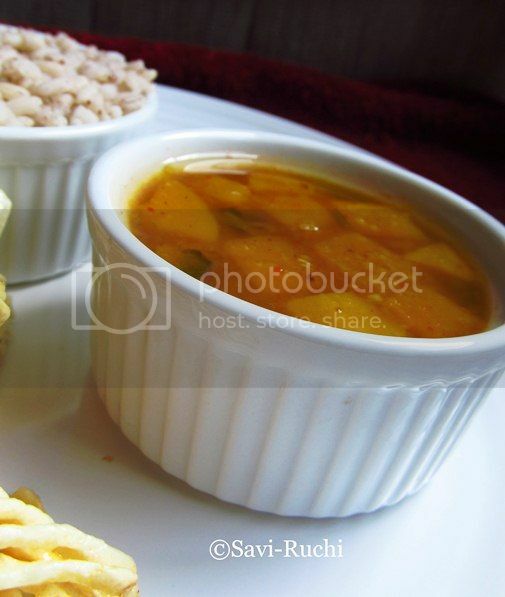 The ghee should coat well on the broken wheat, vegetables & dal. Add the water, salt, red onion to the cooker & let the water boil on a med-high heat. When water starts boiling, close the lid of the pressure cooker. Let it cook on med-high heat. Remove the cooker from the heat after 3 whistles. Let the cooker sit for 5-7 mins or until the pressure is released completely. 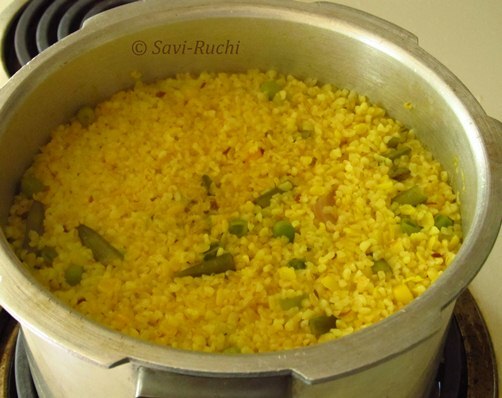 Mix the khichdi well & serve it with a side dish of your choice. 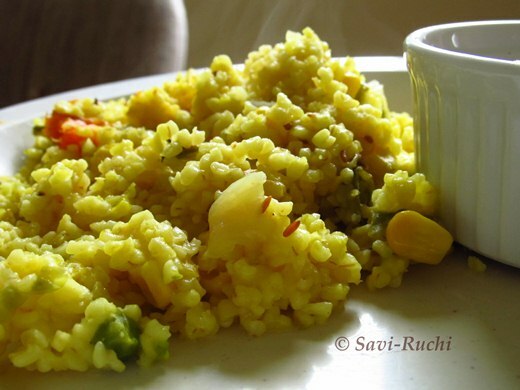 We love to eat this khichdi with plain yogurt, boondi raita, chutney or a vegetable kurma/saagu. Relish it with whatever you like. My friend says, do not try adding green chillies or black pepper. The dish tastes better without any heat! Broken wheat can be easily found in any Indian grocery stores. Broken wheat to water ratio is 1: 2.5 cups. The Udupi or South Canara cuisine is very vast. During every visit to my hubby's aunties house, I learn one new dish. One such dish learnt recently is bolu huli. 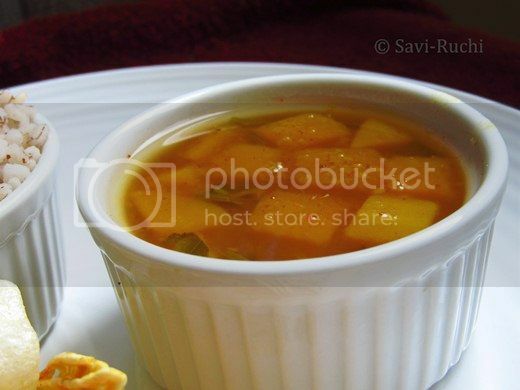 My son loves the aroma of this sambar & everytime I make this, he is sure to say "amma(mom), what are you cooking? It is smelling very good!". He relishes it with matta rice(Kerala/Udupi red rice). Add the diced pumpkin, turmeric, slit green chillies & 4 cups of water. Cook on med-high heat covered. When pumpkin is 3/4th done, add tamarind, jaggery, salt & cook on a med-low for another 5-7 mins. 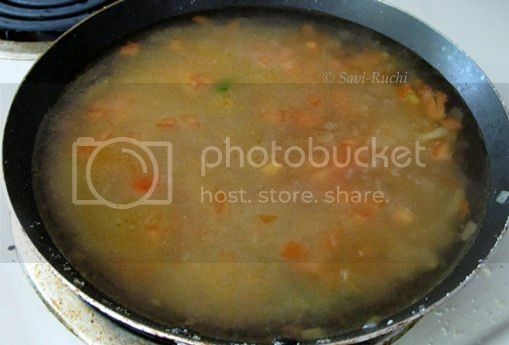 Mash the cooked dal & dilute it with half a cup of water. Add the dal, curry leaves, asafoetida, rasam powder & coriander leaves. Boil on a medium heat for another 5 mins. Serve it hot with rice & fritters/papad or chutney. Adding a bit of rasam powder, gives a 'kick' to this bolu huli. Do not skip asafoetida.It enchances the flavor. 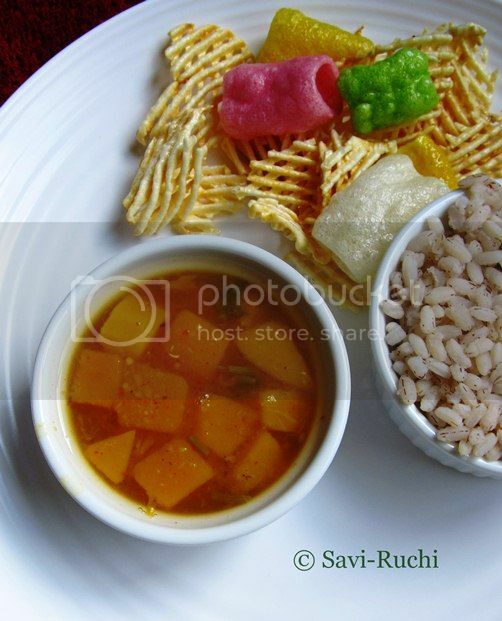 You could make this bolu huli with other vegetables like egg plant or okra/ladies finger.